We’d love your help. 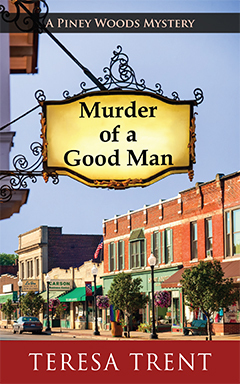 Let us know what’s wrong with this preview of Murder of a Good Man by Teresa Trent. When Nora Alexander arrives in Piney Woods, Texas, to fulfill her dying mother’s last wish, she has no idea what awaits her. First she is run off the road, then the sealed letter she delivers turns out to be a scathing rebuke to the town’s most beloved citizen and favored candidate for Piney Woods Pioneer: Adam Brockwell. Next thing you know, Adam has been murdered in a na When Nora Alexander arrives in Piney Woods, Texas, to fulfill her dying mother’s last wish, she has no idea what awaits her. First she is run off the road, then the sealed letter she delivers turns out to be a scathing rebuke to the town’s most beloved citizen and favored candidate for Piney Woods Pioneer: Adam Brockwell. Next thing you know, Adam has been murdered in a nasty knife attack. Suspicion instantly falls on Nora, one of the last people to see him alive. After all, everyone in Piney Woods loved him. Or did they? Nora learns that her mother had a complicated past she never shared with her daughter. To ask other readers questions about Murder of a Good Man, please sign up. I liked the first mystery in Teresa Trent's new Piney Woods series. I really did, and I hope to read the next book. But, her stereotypes and comment about a senior really bothered me when I realized how old the character was. And, neither the author nor the amateur sleuth are young enough to make these comments. More about this later. If the comments won't bother you, you might enjoy Murder of a Good Man. Nora Alexander was surprised with her dying mother's last request. She asked her to deliver I liked the first mystery in Teresa Trent's new Piney Woods series. I really did, and I hope to read the next book. But, her stereotypes and comment about a senior really bothered me when I realized how old the character was. And, neither the author nor the amateur sleuth are young enough to make these comments. More about this later. If the comments won't bother you, you might enjoy Murder of a Good Man. Nora Alexander was surprised with her dying mother's last request. She asked her to deliver a letter to Adam Brockwell in Piney Woods, Texas. Nora could have mailed it, but she drives from New Orleans to the town she never heard of, only to be almost run off the road before she reaches her destination. In Piney Woods, she finds a quirky little bed-and-breakfast with enchanting owners. But, she isn't so enchanted with the people she meets at Brockwell's house. His reaction to the letter stuns her, and, because she presented it unopened, she doesn't know what the letter says. When she asks, she's read a scathing letter that attacks Brockwell. It appears as if her mother hated the man. That comes as a surprise to others because Adam Brockwell is one of the top candidates for that year's Piney Woods Pioneer award for the best citizen in town. When Brockwell is killed, the hunky police chief, Tuck Watson, looks at Nora as the only one known to hate the man. He asks Nora to stay in town. Desperate for money, she accepts a job helping Tuck's aunt restore a historic hotel. It gives her time to search for someone else who might have wanted him dead. Nora Alexander doesn't want to end up in prison now that she runs into people that know her mother's history. Murder of a Good Man is an enjoyable story. The historic hotel shows great potential for future books. But, here's my issue with Trent's comments, and Nora Alexander's. Nora is thirty-three. Yet, when she and other characters discuss Adam Brockwell, they refer to him as "an old man", "a grizzled old man", "in his old age". I could accept that until about halfway through the book when a character says, "Maybe he wasn't as on top of his game as he used to be. The old guy had to be close to sixty." What the heck? What thirty-three-year-old views a man not yet sixty as old? Nora is a strong and independent woman that is on one last mission for her mother, to bring a letter to a man in this small Texas town. However, less than 24 hours later he is murdered and Nora is the prime suspect. And as with all cozies, she has to uncover the truth as to who murdered Adam Brockwell and clear her name. There are quite a few interesting An intriguing start to a new series set in the Piney Woods of East Texas. And since I have family in East Texas, I felt like I was right at home. There are quite a few interesting town citizens that play an important role in helping Nora uncover the truth and clear her name. And by getting to know these people, she also makes some friends and learns some history about her mom that she never knew before arriving in this town. The mystery was quite an adventure and I think I only suspected this character because there was no one else that seemed a likely suspect. There were some clues but not many to try and decipher the motive and reasoning for Adam's death. It would be remiss to omit a budding romance and Nora has caught the Sheriff's eye. He is quite smitten with her and there are a few witty comments he makes that will definitely make you chuckle. I found this novel to be entertaining and a darn good murder mystery as well. A young woman strives to fulfil her Mother's last request of delivering a letter by hand to a person in Texas that the young woman never has heard of. Having become homeless and jobless upon her Mother's passing, our heroine is ready to find a new life. Which is good as the receiver of the letter is found murdered the next morning and Nora Alexander finds herself the prime suspect. This story is filled with revelations I found this novel to be entertaining and a darn good murder mystery as well. A young woman strives to fulfil her Mother's last request of delivering a letter by hand to a person in Texas that the young woman never has heard of. This story is filled with revelations for Nora and other town members of Piney Woods, Texas. Family secrets abound in this small town novel. Nora has one last thing to deal with before her old life comes to its conclusion and she begins again. She has no idea why her mother wants a letter hand delivered. As life takes unexpected turns for Nora and secrets unfold, she repeatedly wonders why her mother could not just have mailed her last letter. Characters who you want to like while not knowing who you can trust. Characters who you want to dislike, but you see they have redeeming value. Not Family secrets abound in this small town novel. Nora has one last thing to deal with before her old life comes to its conclusion and she begins again. She has no idea why her mother wants a letter hand delivered. As life takes unexpected turns for Nora and secrets unfold, she repeatedly wonders why her mother could not just have mailed her last letter. I haven't read a cozy mystery for a while, but this book showed me why I love cozies. It was a wonderful cozy read with a lot more going on than just a murder investigation. It is full of some great characters, and is not so devoted to solving the mystery that it forgets to be about the people. I really liked that the characters were well developed and likable, that made it such a delightful story to read. A real page turner for me from the beginning to the end. This is the first book I've read by this author, Teresa Trent, and I do believe I've found another favorite author. I know I will be reading more of her Piney Woods Mystery Series. I'm looking forward to reading Book 2 in the series. I would like to thank the publishers for providing this book for me to read and give an honest review. First off . . . I was reeling right along with Nora about all the secrets! It was a little predictable because Nora's mom on her deathbed asks Nora to deliver a letter to a man she never told Nora about. he was Nora's father. But the secrets don't stop there. And, I can't say more because I just can't 'spoil it'! And that is where 'predictable' ended. I promise if you a fan of a good Cozy you'll love this Cozy. You might just have a First off . . . I was reeling right along with Nora about all the secrets! And that is where 'predictable' ended. I promise if you a fan of a good Cozy you'll love this Cozy. You might just have a hard time figuring out 'Who Dun It'. 1 has the makings of a great series. I can't wait to read more about this little town. And, to see what trouble Nora might get into down the road! I might be a tad biased because the story takes place in the Piney Woods of Texas my home state. And, the cover 'got me' because it reminded me so much of a town close to me that is so fun to visit and shop in! In this enjoyable mystery, Nora travels to a quaint Texas town where she is soon entangled in a murder investigation and uncovers an abundance of secrets about her mother’s past and the past of the town’s favorite man and benefactor. With the help of local B&B owners and the hotel owner, Nora draws on her inner strength to cope with the challenges she faces. Her interactions with Tuck add a potential romantic interest to her life, which I suspect will be a thread in future books in the serie In this enjoyable mystery, Nora travels to a quaint Texas town where she is soon entangled in a murder investigation and uncovers an abundance of secrets about her mother’s past and the past of the town’s favorite man and benefactor. With the help of local B&B owners and the hotel owner, Nora draws on her inner strength to cope with the challenges she faces. Her interactions with Tuck add a potential romantic interest to her life, which I suspect will be a thread in future books in the series. Some aspects of the plot were somewhat predicable, though there were a few unexpected twists. Overall, an interesting and well-paced start to a new cozy mystery series. Nora Alexander is alone since her mother recently passed away. On her death bed Kay asked her daughter to deliver a letter to a man in Texas. That same man is found stabbed to death within hours of reading the letter. Nora discovers family members in Piney Woods she never realized existed. Her mother kept many secrets, including her first name and the fact that she grew up in this town. I enjoyed Trent's book. It was a quick read with lots of characters and many possible suspects. But it seemed Nora Alexander is alone since her mother recently passed away. On her death bed Kay asked her daughter to deliver a letter to a man in Texas. That same man is found stabbed to death within hours of reading the letter. Nora discovers family members in Piney Woods she never realized existed. Her mother kept many secrets, including her first name and the fact that she grew up in this town. This story has a great vibe to it and fits the cozy mystery category perfectly. It starts off with a doozie of a murder to solve, but as Nora investigates juicier small-town secrets come to light making it much more than just that. I thoroughly enjoyed all of the twists in the story, some I did not even see coming. All of the characters were well-developed and each added their own touch to the story. I would recommend this to anyone who enjoys a good cozy mystery. Reviewer for Coffee Time Ro This story has a great vibe to it and fits the cozy mystery category perfectly. It starts off with a doozie of a murder to solve, but as Nora investigates juicier small-town secrets come to light making it much more than just that. I thoroughly enjoyed all of the twists in the story, some I did not even see coming. All of the characters were well-developed and each added their own touch to the story. I would recommend this to anyone who enjoys a good cozy mystery. Glad I took a chance on this first book in a new series. It caught my interest from page 1. While being an intriguing murder mystery, it’s also a heartwarming story with so many hidden secrets & just a touch of paranormal overtones. Looking forward to book 2! A good mystery. I read this book on my Kindle. A great kick-off to a new series! I really enjoyed this story and wouldn't mind seeing what comes next in Piney Woods. This story has a great vibe to it and fits the cozy mystery category perfectly. It starts off with a doozie of a murder to solve, but as Nora investigates juicier small-town secrets come to light making it much more than just that. I thoroughly enjoyed all of the twists in the story, some I did not even see coming. All of the characters were well-developed and each added their own touch to the story. I would reco I really enjoyed this story and wouldn't mind seeing what comes next in Piney Woods.